Reliable climate data is crucial for informing decision making on matters relating to climate change adaptation. However, the task of creating effective climate data management systems has often been a challenge for developing countries. This study analysed the capacity of 20 weather observation stations in providing reliable and adequate climate data for effective climate change adaptation in the Lake Chilwa Basin, an area in the south east of Malawi in southern Africa. Prevailing climate data capture and management practices were analysed for consistency with standards set by the Department of Climate Change and Meteorological Services. The study shows that 14 out of the 20 stations surveyed were operational. However, out of these, only 7 had standard equipment and none had qualified personnel resulting in poor data capture and management practices associated with inadequate and poor quality data. Deterioration of the climate data management infrastructure in the Basin was attributed to vandalism rampant in late 1990’s and declining institutional support towards climate data management. We recommend revamping of the climate data management system in the Basin through installation and use of standard equipment in existing weather observation stations; installation of additional observatories to improve coverage; training of staff, institutions and stakeholders in effective management of climate data systems; development of partnerships among government and nongovernment organisations, the private sector and communities for sharing of costs and benefits associated with climate data management and utilisation; and development of a framework for climate information dissemination and sharing, which would also act as a backup for climate data at district and national levels. LEAD Southern and Eastern Africa, in collaboration with WorldFish Centre and Forest Research Institute of Malawi, received funds from the Norwegian Government for implementation of the Lake Chilwa Basin Climate Change Adaptation Programme, which is aimed at enhancing the resilience of vulnerable basin communities to adapt to the impacts of Climate Change through improved natural resources management and alternative livelihood enhancement strategies. The Programme understands the importance of collecting, analysing and disseminating up-to-date climate related information as key to informing decision-making and enhancing climate change adaptation at local, district and national levels. In view of this, the Programme conducted a study aimed at establishing the baseline on climate data capture, analysis and utilisation in the basin with a view to identify gaps that could be filled by the Programme and other stakeholders and opportunities that could be utilised for effective management of climate change in the basin. In simplified terms, climate data refers to the records, measurements and observation of climate overtime. Over time there have been modifications in climate data capture and utilization. In 1853 a global system for sharing this information between countries was developed. Defining uniform data collection standards was an important step in producing a truly global dataset of meteorological information, allowing data collected by many different people in different parts of the world to be gathered together into a single database (Egger and Carpi, 2008). Since then, system performance (including data capture, processing and utilization) has increased over the years mainly due to a better understanding of meteorological communication characteristics and improved equipment. The increasing use of satellites to fill the large gaps in observations over the oceans and unpopulated land has been one of the major improvements. In recent times, for example, the common trend, especially in developed countries, is that data manually collected at a rainfall station is mailed to headquarters at the end of the month for eventual analysis, whereas information from a full weather stations is immediately transmitted to the relevant central data processing facility for forecasting and is subsequently passed on as climate data (Edward, 2000). In Malawi, meteorological data collection dates way back to the early 1890’S when the country became British Protectorate. Data then were recorded by administrators at the British Overseas Management Administration (BOMAs), missionaries, farmers and a few interested individuals. Thus the station network then reflected the logistics of the recorders or owners of the stations rather than technical aspects hence there was no consistency in data collection, processing and utilisation. A good number of stations were sited along the Shire River and a concentration existed over the Shire Highlands in the tea estates (Department of Climate Change and Meteorological Services (DCCMS), 2006). Reliable climate data is crucial for informing decision making on matters relating to climate change management, especially where adaptation is to take place. On the global scale, climate data has been used in determining changes in the global climate. Specifically, climate data has been used to provide an understanding of the current and projected disruptions in the evolution of the global climate system caused by greenhouse gases (GHGs), which form the basis for addressing vulnerability and planning adaptation to climate change. Studies by the World Bank (2010) suggest that successful design and implementation of adaptation programs rely on both the quantity and quality of available climate data. In this regard, long-term observations sustained over decades are a critical first step in providing the climate data necessary for scientists, decision makers, and stakeholders to make adaptive choices that could improve resilience to climate change and maintain economic vitality (World Bank, 2010). According to the World Bank (2010), the data collection process also provides the framework for building the capacity of communities to adapt to climate change. It helps them revise their climatic expectations and integrate traditional knowledge, which is an important part of adapting. Worldwide, the patterns of precipitation and temperature are often taken as the concise description of the climate of a place (Trewarth, 1980). The records of the two: temperature and rainfall, due to their vast availability and significance in climate, form a significant component in climate data. Temperature is primary because it holds the evidence of global warming, which is closely linked to climate change, and can be measured or reconstructed for both the earth’s surface and sea surface. The evidence of global warming draws principally on instrumental records since the late nineteenth century and the best evidence in the 20th century (Burroughs, 2001). Expressed as a global average, surface temperatures have increased by about 0.74°C over the past hundred years, between 1906 and 2005 (IPCC, 2007). Secondly, precipitation which implies rainfall and snow falling acts as another indicator of relative climate variation and change. The frequency of data collection of these parameters varies according to the needs of the collecting institution. This study was conducted to assess the status of climate data collection, processing and utilisation in the Lake Chilwa basin so as to identify the challenges and opportunities that would inform further developments under the Lake Chilwa Basin Climate Change Adaptation Programme (LCBCCAP). The study was conducted in the Lake Chilwa Basin which is characterised by the Zomba-Malosa Mountain to the west and the Lake Chilwa Wetland to the East, bordered by Mulanje Mountain to the Southeast. The basin covers the three districts of Machinga, Phalombe and Zomba that has a total population of 1.4 million, approximately, with density of about 194/km2. The study concentrated on obtaining information across the ten selected hotspots for the LCBCCAP. The climate of the Basin is uneven and erratic. Temperatures vary with altitude and range from highs of 30 degrees Celsius to 10 degrees. The highlands receive from 1000 to 1600 mm a year in rainfall while the plains receive only 800-900 mm. In some years, annual rainfall reaches up to 2,400 mm per annum usually resulting in floods (EAD, 2006). Climate data available from the 1960s to the present shows that fluctuations in rainfall and temperature and evapo-transpiration are common in the Basin and there appears to be a slight decline in rainfall and a rise in maximum temperature of about 1 degree. The Basin exhibits diverse landscape from the highlands to the plain and the lake with varying changes in vegetation from evergreen and semi-evergreen forests in the Mountains to deciduous savannah intermixed with annual crops in the plain and Afromontane grassland characterised by typha swamps in the wetland. The Basin also contains a large number of nationally and internationally important flora and fauna, which include about 160 species of resident and many migratory water birds (Bhima, 2006). The varied habitats of Lake Chilwa wetland provide food, shelter and breeding areas for the waterfowl, mammals, and amphibians. Currently, 80 percent of people in the basin are smallholder subsistence farmers and fishermen (NSO, 2008). Crops grown include maize, rice, groundnuts, cassava and tobacco. The fisheries sector is considered as the most important natural resource sector in and around the lake, yielding about 25,000 tonnes of fish per year and contributing up to $17 million a year (Bhima, 2006). Twenty weather observation stations were selected from a total of 47 weather observations stations available in the Basin as recorded and provided by the Department of Climate Change and Meteorological Services (DCCMS). The register was used as the sampling frame and stratified random sampling was applied to incorporate spatial, administrative and categorical considerations. Of the 20 stations sampled, 1 was full meteorological station, 5 subsidiary stations and 14 rainfall stations. This classification is based on MET standards following the World Meteorological Organisation (WMO) classification based on satisfaction of specific criteria that include weather parameters that are observed, quantity and quality of equipment available, weather observation times and qualification of meteorology observer managing the station. Data was collected using a set of approaches including a desk study (literature search), institutional survey involving field data collection and key informant interviews. A set of guiding questions was prepared to aid the interviews. In addition, a checklist was prepared and used to assess the applicability and fulfilment of expected standards in relation to climate data collection, analysis, management and feedback processes. The data collected from literature search and key informant interviews were aligned and compared by thematic areas based on the guiding questions. The key thematic areas were: data collection, data storage and retrieval, data analysis and interpretation, data adequacy and quality and data Management and utilisation. The study has established that rainfall is the main climate data collected in the Basin. Historical records dating from the 1980’s showed that all the rainfall stations (n=14) collected rainfall data only while the other stations (5 subsidiary stations and 1 full meteorological station) collected both rainfall and temperature data plus other weather parameters such as wind speed, humidity, sunshine evaporation, and solar radiation at some point in their operation time. We also observed that allocation of personnel towards climate data capture and management is haphazard as all the stations surveyed did not have specific people to work as meteorological observers. Instead, the responsibility of capturing and managing climate data was simply assigned to any existing personnel as an add-on task. As a result, most officers given this responsibility were not fully aware of the significance and requirements of the task at hand. Further, none of these personnel were qualified to perform the task as they had not undergone the designated basic training for the task as required by the DCCMS based on WMO Standards. Currently, the DCCMS is the only institution in the country that offers meteorological courses for weather observers. However, the training requirements are set and demanded by the host institution while the standards are set by the Department of Climate Change and Meteorological Services based on WMO guidelines. This is the case because establishment and management of meteorological stations in the country is the responsibility of the host institution. Lack of trained met observers is a huge gap in fulfilling climate data requirements for the basin as quality is compromised. Consultations with supervisors of the observers revealed that minimal differences in the data are often neglected and considered insignificant by the observers, which results in misrepresentation of the data and complicates analysis of the entire data set. In terms of equipment, the rain gauge and thermometer are commonly used for measuring precipitation and temperature, respectively. This is consistent with world practice although the quality and designs differ depending on the quality, end use and resource availability. Studies show that on the global scale and more especially in developed countries, there has been considerable advancement in technology overtime in the quest for increased efficiency and accuracy (Egger A, 2009). Internationally, there has been a significant increase in the use of buoys and weather radar to monitor temperature and precipitation where a network of observing stations is located throughout the world to obtain climate data. Presently, over 10 thousand land based stations and hundreds of ships and buoys provide surface weather information in this manner. Sharing of climate data has also increased with the WMO coordinating 175 member countries in the exchange, standardisation and certification of weather data and observation procedures among nations (Ahrens, 2001). In addition, satellites have also been employed to fill large gaps in observation over the ocean and unpopulated land (Edward, 2000). Recording of climate data varies from approved and unapproved stations with approved stations using the professionally designed meteorological (MET) registers while unapproved stations used make-shift registers. Protective clothing for personnel responsible for data collection is considered vital especially in cases of extreme weather although this is lacking in most stations due to resource constraints, management decisions and other factors. This study established that out of the 20 stations surveyed, only 7 had standard rain gauges while 7 were using substandard (plastic) rain gauges while 6 have no rain gauges at all. Plastic rain gauges are not calibrated to standard, have a wide mouth and are prone to splashing effect, all of which distorts data. 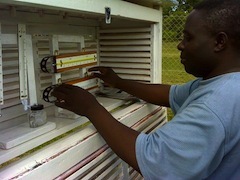 Chancellor College, Naminjiwa and Ntaja are the only three stations in the Basin that have well installed Stevenson screen boxes with maximum and minimum thermometers. The responsibility of providing financial resources for maintenance of climate data systems in the basin rests in the host institution and this is consistent with theories and concepts on sustainable climate data management (Rodgers, 2010). According to Rodgers (2010), the traditional model of government funding meteorological stations, owning and maintaining meteorological observing networks is not sustainable in many places where reduced budgets and a lack of skilled labour have resulted in vastly reduced capacity and capability to observe the climate. Inadequate finances have also led to the stations failing to maintain and acquire new equipment hence leading to their closure. In addition, the unskilled and mostly unpaid personnel that are involved in data collection lack consistency, which leads to intermittent data collection and subsequent station closure. Funding is indeed a challenge in the basin as 18 out of the 20 stations surveyed do not have specific financial allocations for this purpose. As a result, institutions resort to using poor measuring instruments that compromise accuracy and in worst cases, total closure as had been the case for Domasi College Weather Station that completely closed down after being vandalised in 2006. Financial constraints are a major contributing factor towards inadequacies in climate data capture and management in the southern hemisphere where the network of observations remains low (Magrath, 2009; Edward, 2000). The DCCMS has set the quality control system for ensuring that data is checked for errors. Through this system all errors and mistakes originating from the stations, measuring instruments, data transmission or data entry stages are detected and eliminated in as far as possible while maintaining original values. In the basin the adequacy and quality of data is determined by the end users who examine it to check if meets their needs. In the agriculture sector, for instance, this exercise is undertaken by the Rural Development Programmes (RDPs). These are district-based agriculture offices located across the country. The three RDPs for the basin are Machinga, Phalombe and Zomba. Despite this arrangement, presentation of incorrect and inconsistent data by the Extension Planning Areas (EPAs) has been a major gap associated with adequacy and quality of climate data in the agriculture sector, which is not surprising considering that there has been a growing concern on the inadequacy of climate data worldwide although the situation is worse in developing countries (Jagtap, 2008). The situation is further exacerbated by poor networks of meteorological stations (Eludoyin, 2009). In Malawi, the current situation is that some weather stations have either closed or only record intermittently hence affecting the overall climate data adequacy and quality (Benson, 2010). In the Lake Chilwa Basin, District Agriculture Development Officers (DADOs) lamented that quality of data generated at the EPA is compromised due to heavy workloads on extension personnel that is exacerbated by the influx of nongovernmental organisations (NGOs) that constantly demand their services. Despite all this, Malawi has a record of relatively dense network of meteorological stations at national level, which collect precipitation and daily minimum and maximum air temperature. In some cases, the record is quite lengthy for these data which goes back to the late 1800s. However, currently the large proportion of this dataset, covering the entire country, is trapped on mainframe computer tapes for a computer that is no longer in operation (Benson, 2010). In response, the International Environmental Data Rescue Organization (IEDRO) is set to enhance data storage by collecting weather information from Malawi and other countries with plentiful and important historical weather data which need to be converted into usable digital format. This is deemed to have improved the status of climate data in these countries (International Data Rescue News, 2009). Adequacy and quality of climate data also relies on the systems involved. Most Meteorological systems which have the capacity of handling climate data, have emphasized the delivery of meteorological and hydrological products and neglecting the complementary role of supporting users’ decision-making processes, which can only be achieved by working more closely with users/stakeholders (Roger, 2010). Our assessment is that in the present state, the quantity and quality of climate data for the Basin is not adequate to inform effective local level decision making on climate change in the Basin. Data analysis at the rainfall station and EPA mainly involve calculation of mean average rainfall that is used to determine changes in the rainfall pattern. This data is submitted to the RDP for further analysis and subsequent use in crop estimates within the various departments of the agriculture sector. Machinga RDP reported of forwarding this data to the DCCMS fortnightly for further analysis. Data analysis in the agriculture sector has mainly been frustrated by technical and logistical challenges including poor recording, storage and inadequate use of technology. Incorrect data from the EPAs which does not match with the observed weather presents a challenge in the analysis. In addition, late submission of reports from the EPAs prevents consolidation. Electronic data storage is a relatively new system that has not been mastered and this is posing a challenge in capturing historical climate data that has been kept in hard copy for some time. As such, data retrieval is a challenge except for data within the past 4 years that has been kept electronically. Poor storage has resulted in loss of climate data and this presents a challenge during analysis. Despite these challenges, recent advancements in information and communication technologies, including the proliferation of computers, wireless and mobile telecommunication, provides an opportunity for addressing most of the challenges associated with adequacy and quality of climate data in the basin and the country. The DCCMS has set standards for storage of meteorological data. For instance, all paper records should be stored in a controlled environment to avoid deterioration and possible destruction by temperature and humidity extremes, insects, pests, fire, flood, accidents or vandalism. In addition, this data should be captured in electronic image form through computers, digital cameras or scanners before archiving. This study has shown that climate data from rainfall stations is stored in hard copy format at the primary station while electronic storage is done at secondary centres that manipulate and use the data and also at subsidiary and full meteorological stations. Manual and unsystematic data storage especially in rainfall stations limits retrieval and hence utilisation of climate data in and outside the basin. For electronic data storage systems, data is mainly lost through computer damage by viruses. Worldwide, climate data is used in Decision Support Systems (DSS) in many socio- economic sectors and in developing general circulation models (GMCs). GCMs and global climate models are widely applied for weather forecasting, understanding the climate, and projecting climate change (Ahrens, 2001). In Malawi, the Department of Climate Change and Meteorology under the Ministry of Natural Resources, Energy and Environment has the responsibility to provide weather and climate data and information for various socio-economic sectors such as aviation, agriculture, water, marine, construction industry, insurance, tourism, health, sports and recreation in the country. It also carries out research and development aimed at improving the quality of weather and climate data and information for the general public (MET, 2010). Similarly, agriculture and meteorological sectors are the main end users of climate data in the basin. Rainfall data from the basin is analysed to serve the agriculture sector. Data from Ntaja full meteorological station, Chancellor College and Mikoko subsidiary meteorological stations and 4 rainfall stations (Malosa EPA, Zomba RTC, Mulunguzi Dam and Likangala Agriculture Scheme) is used by the DCCMS for weather forecasting, which also mainly benefits the agriculture sector in terms of determining crop estimates, which act as an early warning signal for impending food security conditions in a specific area. In view of this, rainfall data from all RDPs is compiled and sent to the Ministry of Agriculture and Food Security where further analysis is done. Despite these advantages, demonstrating the link between climate data and crop estimates to the smallholder farmers and other users has been a challenge due to a combination of factors that include language barriers and inherent indigenous knowledge on the causes of rain, drought and floods. The general traditional belief in the basin is that weather related issues including the incidence and intensity of rains are controlled by the gods such that humans cannot do anything about it. In addition, use of climate data for crop estimates is associated with scientific models which become difficult to elaborate in the vernacular language to the local community, which are the end uses of the data. Further, inadequate resources for information dissemination and monitoring of adaptive decisions have constrained utilisation of data at the local level, where it is generated and would thus be appropriately applied. However, the benefits of climate data capture and processing lie in its usability. If the data and information generated from the community cannot be understood and used by that community then the data collection system is rendered invalid. This has been a major challenge for most meteorological stations that have emphasized the delivery of meteorological and hydrological products only and have not emphasized the complementary role of supporting users’ decision-making processes, which can only be achieved by working more closely with users and or stakeholders (Roger, 2010). Climate data plays a significant role in addressing climate change by providing the data and information necessary for adaptation. Climate data collection, processing and utilization are key elements of the climate change management system, which if well-coordinated will advance a society’s adaptive capacity. However, the status and utilization of climate data in the Lake Chilwa Basin exhibits a lot of gaps and inconsistencies that if not resolved, would present a challenge to decision making on climate change adaptation by local communities. Our analysis shows that little investment in terms of human, material and financial resources have led to the challenges experienced in this sector thereby affecting the quality and adequacy of climate data in the basin. Malawi, in general, and Lake Chilwa basin in particular, requires a proactive approach to improve the climate data capture and management system at the ecosystem level. Improvements should be made in the quality and adequacy of data collected through networking, development and use of innovative technologies and capacity building. Increased realisation of the devastating impact of climate change and the need for adaptation, the existence of government decentralisation, advancements in information and communication technologies, and increased civil society participation in development activities are some of the opportunities that should be utilised for propagating concerted efforts in building climate data management capacity in the basin and the country. There is need for institutionalising climate data management training within all climate data collection stations, which would encompass collecting, processing, storing, updating, packaging and/or disseminating of data and information to various stakeholders. In addition, there is need to provide equipment and training for community collection of local climate data to improve access to weather data and to enhance climate projections. Recommended also is the establishing of a website for information dissemination and sharing, which would also act as a backup for the climate data. This would be coupled with utilisation of upcoming technology such as Geographical Information System (GIS), in connection with climate data collection equipment such as rainfall loggers, which are relatively affordable and are responsive to air temperatures. Finally, developing innovative partnerships between the government and private sector is a solution where government investment in meteorological services is likely to remain a small part of overall spending. National consortia involving a wide group of stakeholders with mutual interests in weather and climate information can collectively fund, maintain and utilize observing networks. However, a framework is needed to ensure that all socially-relevant information is exchanged freely and remains freely available in the public interest. We would like to thank the Royal Norwegian Embassy that provided financial resources for this research under the Lake Chilwa Basin Climate Change Adaptation Programme. Burroughs, W. J. (2001). Climate change: A multidisciplinary Approach. United Kingdom: Cambridge University press. Egger, A and Carpi, A. "Data: Analysis and Interpretation," Visionlearning Vol. POS-1 (1), 2008. Rogers, D. (2010). Development and climate change: Environmental Information Services and Development in World Development Report 2010. Trewarth, A. & Horn, B. (1980). An Introduction to Climate, 5th ed. London: McGraw Hill Book Co. The UMFULA project (meaning ‘river’ in Zulu) aims to support decision-making through providing new and more reliable information about climate processes and extremes in Central and Southern Africa. Soil moisture and temperature are critical to seed survival. This method, developed by a joint USAID-UNDP project, determines the best intervals for sowing wheat using meteorological data. This report summarises the research underpinning climatevisuals.org and presents the key findings so that practitioners can take an evidence-based approach to visual communication. A learning event held in February 2016, in Nairobi, shared good practices and key challenges associated with providing climate and weather information services. This report demonstrates the use of climate information in assessing adaptation needs and adaptation interventions. It also outlines changes in thinking as adaptation moves from theory to practice.